Meet George Jetson; Jane, his wife; daughter, Judy; and his son, Elroy. 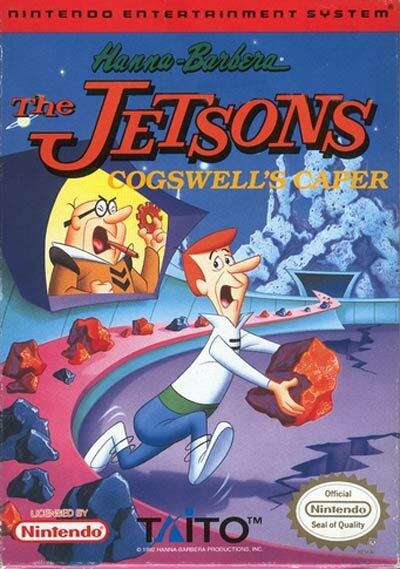 Okay, it's not quite as catchy without the theme music, but THE JETSONS have finally made their way to the Nintendo Entertainment System in THE JETSONS: Cogswell's Caper. With his sights set on Planet M38, Cogswell won't let anything stand in the way of his plan to annihilate the planet. Now, it's up to you to help George stop Cogswell's caper and be the hero. You'll have anti-gravity boots, a glider, and a jet board at your disposal and you'll need all of them, too! If you can survive everything Cogswell throws your way, you just might be able to save Planet M38 from total destruction and be the hero.